While the U.S. East Coast prepares for Hurricane Florence, the U.S. state of Hawaii is feeling the effects of Tropical Storm Olivia. 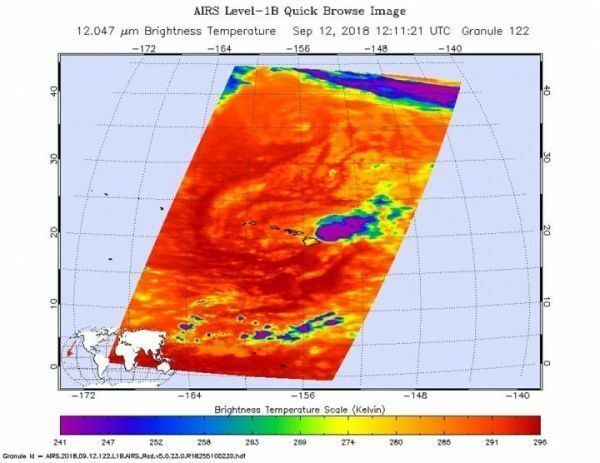 NASA’s Aqua satellite provided an infrared look at Olivia that showed wind shear was affecting it before landfall. On Sept. 12, a Tropical Storm Warning is in effect for Oahu, Maui County including the islands of Maui, Molokai, Lanai, and Kahoolawe. Interests in the Northwest Hawaiian Islands should monitor the progress of Olivia. When NASA’s Aqua satellite passed over Tropical Storm Olivia on Sept. 12 at 8:11 a.m. EDT (1211 UTC) was closing in on landfall in Hawaii. The Atmospheric Infrared Sounder or AIRS instrument analyzed the storm in infrared light which provides temperature information. Temperature is important when trying to understand how strong storms can be. The higher the cloud tops, the colder and the stronger they are.